Home • Active Release Technique • Numbing? Tingling? Burning? Pain? At Back to Health Wellness Centre we often see patients who report feeling numbing, tingling, burning or pain in a particular area of their body. Often these are symptoms of a Repetitive Strain Injury or RSI. Repetitive strain injury (RSI) is a condition where pain and other symptoms occur in an area of the body which has done repetitive tasks (often the lower back, shoulders, arms or hands). Repetitive strain means strain related to actions which are frequently repeated. Treatment includes stopping the task (if possible), improving the work environment and other measures such as Active Release Technique, massage, acupuncture and chiropractic. The term repetitive strain injury (RSI) is used to describe a range of painful conditions of the joints, muscles, tendons and other soft tissues. It is mainly caused by repetitive use of part of the body. It is usually related to a task or occupation but leisure activities can also be a cause. Unlike a normal strain following a sudden injury, symptoms of RSI can persist well beyond the time it would take symptoms of a normal strain to ease. You may also see the term overuse injury. This is a general name for conditions in which the joints, muscles, tendons or soft tissues are used excessively but unlike RSI do not necessarily involve repetition of the same movement. The main cause is frequent and repetitive movements of a part of the body – for example, typing, using a computer mouse a lot, lifting incorrectly, over-reaching, etc. Other factors may contribute, such as poor posture while doing the movement, using excessive force while doing the movement and not having enough breaks from the task. However, the precise reason why RSI develops is not clear. In many cases there is no swelling or inflammation and there are no other obvious problems which develop in the muscles or tendons, and yet symptoms develop. Also, it is not clear why some people develop RSI and not others who do the same repetitive tasks. Which areas of the body are affected with repetitive strain injury (RSI)? Symptoms depend on what the repetitive actions are. In most cases the symptoms develop in a neck, arm, wrist, hand, or lower back as these parts of the body most commonly do repetitive tasks. In recent years it is computer use, playing video games, texting, musicians, knitting, other hobbies, sports and people doing repetitive tasks. People who do a lot of work around the house may develop RSI, or people who do certain sports which involve repetitive movements. What are the symptoms of repetitive strain injury (RSI)? The symptoms tend to develop gradually. At first the symptoms may only occur while you do the repetitive task and ease off when you rest. In time the symptoms can be present all the time but tend to be made worse by doing the repetitive task. Symptoms can range from mild to severe. If you experience any of these symptoms, make sure to have them checked out by one of our practitioners! Since bones and ligaments have no “give”, this puts pressure on the nerve, which can be worsened by repetitive motion and tasks. Middle age is the most common time in life for many of these issues to crop up. These factors cause the body to produce tough scar tissue that binds and ties down tissues, restricting movement. Over time scar tissue builds up, causing muscles to become shorter and weaker, resulting in a reduced range of motion, loss of strength and pain. Active release technique addresses the problems with tendons, ligaments, fascia and nerves, which are often the result of overuse. The Back to Health’s health care practitioners use this technique to aid patients. The issues with joints are addressed as well due to these symptoms. Leg pain – often diagnosed as Sciatica – can be a painful and debilitating problem that commonly interferes with walking, standing, sitting, and sleeping. In some cases it is difficult to find any comfortable position at all. Along with pain, symptoms such as throbbing, numbness, weakness, and “pins-and-needles” can also be present. Adding to the frustration of these symptoms, this type of leg pain is often initiated by a seemingly routine task, or in many cases has no clear cause at all. To make matters even worse, these leg conditions are slow to respond to traditional types of care, often creating further disappointment and aggravation. As the lower 5 nerve roots exit the spinal column they join together to form the Sciatica nerve. 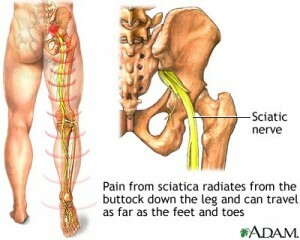 Sciatica refers to pain that develops as a result of compression or irritation of this nerve. As the nerve roots come together to form the Sciatic nerve – which occurs close to the spine in the upper region of the hip – the Sciatica nerve travels down the back of the leg all the way to the foot. As the nerve travels down along the back of the hip, thigh, knee, and calf it must pass between – and in some cases through – the muscles of these regions. As long as the muscles are loose and flexible, and the nerve is able to freely glide along these muscles, the nerve remains healthy. However, if the nerve becomes compressed or irritated at any point along its path from the spine to the foot, Sciatica pain can develop. It is important to realize that Sciatica refers to a group of symptoms that occur as a result of injury and irritation to the Sciatic nerve. It is not a specific diagnosis and does not indicate what is actually causing the nerve irritation. Actually, there are many distinct conditions that can cause the Sciatic nerve to become injured. One common misconception is that Sciatica always results from a Disc Herniation of the lower back. Although Disc Herniation’s often result in Sciatica symptoms, they are actually one of the less common causes of Sciatica. The hip, knee, and ankle are joints that require a complex system of muscles to ensure proper movement and to protect each area from injury. Through a variety of causes such as excessive or repetitive use with certain sports or occupations, muscle imbalances, prolonged sitting, previous injury, or lack of stretching and exercise, it is not uncommon for small amounts of strain and imbalances to develop with the muscles and joints of the hip, knee, and ankle. Over time this strain can develop into what is known as micro-trauma. Simply stated, micro-trauma is very small scale damage that occurs in the muscles, tendons, joint capsules, and ligaments in response to small levels of strain. Initially this micro-trauma is not painful, but may be perceived as a mild ache or tightness in the muscles. Although only small, this damage still needs to be repaired. The body responds to micro-trauma in a predictable way – by laying down small amounts of scar tissue to repair the area. Unfortunately, over time this scar tissue will build-up and accumulate into what we call adhesions. As adhesions form they will start to affect the normal health and function of the muscles and related joints, often leading to pain, tightness, stiffness, restricted joint motion, and diminished blood flow. In addition to causing problems in the muscles and joints themselves, the accumulation of adhesions can also cause considerable strain and irritation to the Sciatic nerve as they will restrict the normal sliding of the nerve between the muscles. Recall that the Sciatic nerve passes between and through the various muscles of the hip and leg and to remain healthy must be able to freely slide between these muscles. As adhesions develop they will cause the muscles to become tight and restricted, which will in turn compress the Sciatic nerve trapping it between the muscles and muscle layers. In addition to becoming trapped by the tight muscles, as adhesions develop along the path of the Sciatic nerve the nerve itself can actually become “stuck” to the surrounding muscles. In either situation the ability of the nerve to slide is drastically compromised. 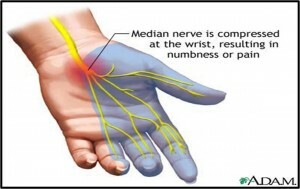 When this happens the nerve is forced to stretch instead of slide, which causes the nerve to become irritated. As the process continues further strain is placed on the nerve and surrounding muscles, which in turn leads to even more micro-trauma. Essentially a repetitive strain injury cycle is set-up causing continued adhesion formation and progressive nerve irritation – and more severe nerve injury if the condition is allowed to continue. It is possible for the Sciatic nerve to become trapped and irritated at any point along its path between the spine and the foot; however, there are certain areas where the nerve is more prone to entrapment. 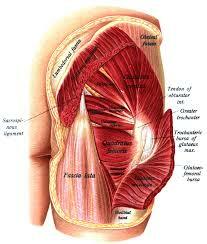 One of the most common areas of entrapment is at the Piriformis muscle, which is located deep in the back of the hip. The Sciatic nerve travels directly underneath (and in some cases through the middle) of this muscle, and it is very common for this muscle to become tight and to develop adhesions. When this happens it can entrap and irritate the Sciatic nerve, and result in Sciatica symptoms. 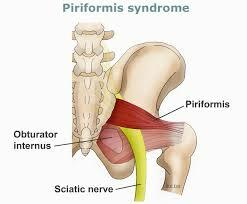 In this case, the diagnosis would be Piriformis Syndrome. As the Sciatic nerve travels further down the leg, it is also very common for entrapment to occur at the Hamstring muscle, between the Hamstring and Adductor muscles on the inner thigh, at the top of the calf as the nerve passes through the Soleus muscle, and finally as it passes under the ligaments of the on the side of the ankle. The interesting fact is that when the nerve becomes entrapped at any of these sites, it can cause pain and other symptoms to be felt along the entire nerve, not just the area where the nerve is entrapped. Making matters more complicated, it has also been found that as the nerve is irritated and entrapped at one site, it becomes more prone to irritation at other sites as well. This leads to what is referred to as a “Double Crush” Syndrome as the Sciatica symptoms are actually being generated at 2 different entrapment sites. Obviously, when this occurs both sites must be addressed for complete resolution to be reached. How Can These Nerve Entrapments Be Fixed? This problem normally requires a multi-faceted approach of chiropractic for the affected joint, active release for the pinched nerve, changes in lifestyle (posture, lifting, etc), icing, acupuncture; use of a machine to aid nerve recovery, the list is endless! The problem has to be addressed by further assessing and correcting problems not only at the site of pain itself, but also in other areas of the kinetic chain, which are associated with movement compensations and are often contributing factors to the problem. To book an appointment to see if us for an assessment or if we will be able to help with your related injury, simply call our office at 613.237.3306.
such as jumping or running. 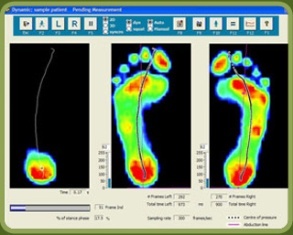 You should contact us about having a foot scan/dynamic gait analysis to see if you require custom orthotics. Especially, if you run or are physically active or if you are experiencing symptoms of Metatarsalgia. It is important to seek treatment as soon as possible to prevent further damage and eliminate the pain you are feeling. Contact us to set up an appointment to discuss treatments for Metatarsalgia and to discuss different options such as: metatarsal pads or custom orthotics that can help reduce the pain you are feeling while allowing you to maintain your active lifestyle. The toe joint normally needs to be put back in place by adjusting it as well. Metatarsal pads are used to help spread your transverse arch (the arch behind the ball of your foot, which runs across the width of your foot), promote the return of your overextended toes to their normal anatomical position, and encourage the return of your forefoot fat pad to its rightful position supporting your metatarsal heads. Your metatarsals are the long, thin bones in your mid-foot. The heads of your metatarsals are at the ball of your foot, and they connect to the base of your toes. 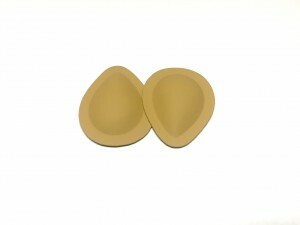 Metatarsal pads help properly realign your metatarsal heads and the fat pad that’s underneath them. This, in turn, can help straighten and realign your toes, especially when your metatarsal pads are used in conjunction with our toe-spacing product. Metatarsal pads, when properly placed within a completely flat shoe with a sufficiently wide toe box, can help undo muscle imbalance in your foot. Metatarsal pads help reconfigure your foot to the position that nature intended; that is, with splayed metatarsal heads, splayed toes, and a fat pad located directly underneath the fragile bones and nerves in the ball of your foot. Numerous foot and lower extremity problems can be prevented or reversed by restoring your natural foot anatomy and function.